The plant in this picture dates from the Pleistocene Age, 30,000 years ago, before agriculture, before writing, before the end of the last Ice Age. And while it's not accurate to say the plant itself is that old, scientists in Russia say they regenerated it from frozen cells they found beneath 125 feet of permafrost in what is now northeastern Siberia. It was cultivated in the lab, with help from some "clonal micropropagation," say the scientists, from seeds and leaves probably collected by some long-ago species of squirrel. The researchers, publishing their find today in Proceedings of the National Academy of Sciences, say the squirrel's burrow was probably frozen over quickly, and stayed that way until they discovered it. "The squirrels dug the frozen ground to build their burrows, which are about the size of a soccer ball, putting in hay first and then animal fur for a perfect storage chamber," said Stanislav Gubin, one of the authors of the study, who spent years rummaging through the area for squirrel burrows. "It's a natural cryobank." 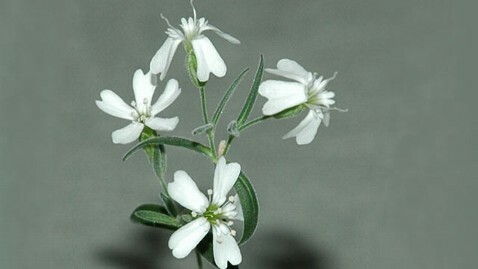 The plant is of the species Silene stenophylla, and radiocarbon dating says it is 31,800 years old, plus or minus 300 years. The Russian scientists report they were able to grow it in a conventional pot, and after a year of tender loving care, they say it blossomed, bore fruit, and dropped seeds. It lived, in other words, as if there had never been a 30,000-year interruption. "The first generation cultivated from seeds obtained from regenerated plants progressed through all developmental stages and had the same morphological features as parent plants," wrote Svetlana Yashina and a team at the Institute of Physicochemical and Biological Problems in Soil Science, Russian Academy of Sciences. "We consider it essential to continue permafrost studies in search of an ancient genetic pool, that of pre-existing life, which hypothetically has long since vanished from the earth's surface." It all may sound a bit incredible - and other scientists will be skeptical - but beyond that, why does it matter? The scientists say the world's permafrost - about 20 percent of the planet's surface - could be a vast time capsule, a place where ancient life is preserved, could be revived, and could speak volumes about the evolution of life on Earth. They also point to the Svalbard Global Seed Vault in the northernmost reaches of Norway, an ultra-high security, ultra-low temperature bank for the seeds of every plant we eat - more than two million of them. More than 100 nations have left seeds there in a sort of frozen Noah's Ark, so that species can be recovered in case of some sort of calamity. When the vault was set up in 2008, there was doubt it would be useful. The Russian team now says it is "of great interest and importance," worth keeping up.